Transportation and mobility are emerging as potential drivers of innovation and economic growth of the 21st century. Rapidly evolving technologies and business models for delivering mobility services have dramatic potential to transform the global transportation sector in the times to come. Mobility that ranges from pedestrian, personal transport, to public transit and freight movement is extremely critical and impacts every aspect of life in urban as well as rural areas. Of late, there has been a paradigm shift which has led to an integral approach that focuses on shared, connected and clean mobility solutions customised to local needs. Against this background, NITI Aayog, in collaboration with various ministries and industry partners, is organising ‘MOVE: Global Mobility Summit’ in New Delhi on 7th and 8th September, 2018. 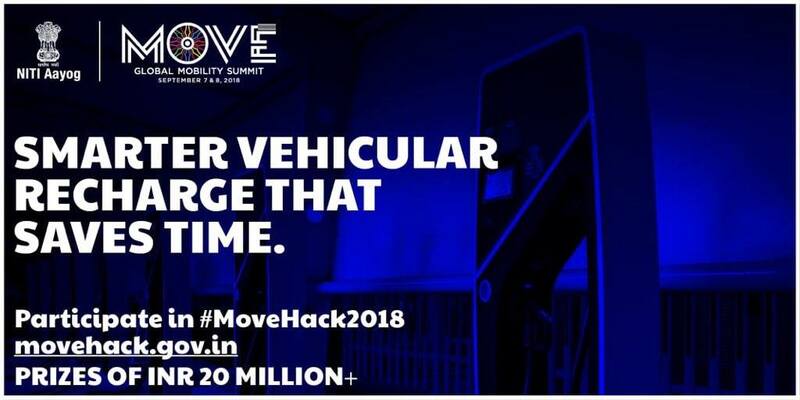 Global Mobility Hackathon will be an integral part of this event, providing a platform to the participants to come up with innovative ideas and solutions on issues concerning mobility. National Institution for Transforming India (NITI Aayog) is the premier policy think tank of the Government of India and is chaired by the Hon’ble Prime Minister of India. Formed via resolution of the Union Cabinet on January 1, 2015, NITI Aayog has the mandate to provide both directional and policy inputs to transform the lives of Indian citizens and work closely with State Government while promoting cooperative and competitive federalism.